The Legacy Trail is an excellent paved trail that starts right across the street of the hotel. Turn left onto the trail and follow it past the skateboard park, the softball fields and the disc golf area down to the river. The trail runs along the river all the way out to Glenshire, making a round-trip of about 10 miles. 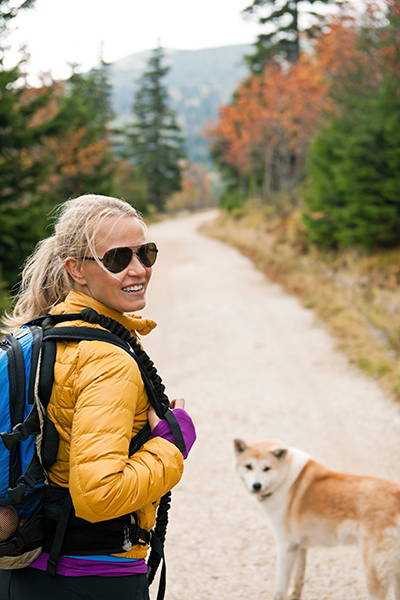 The trail is a great way to get some exercise for you and your dog! Along this trail there are numerous spots to stop with the dog and play in the river. (just past the foot bridge over the river, there is a “single track” that goes right down to the river’s edge). Starts in Martis Valley on the way to Northstar. You can hike around the meadow, which is on the right side of the highway. Longest loop is about 5 miles. Surrounded by big open, lush meadows, wild flowers, and a peaceful calming creek. Starts across from the parking lot of the Tahoe Donner old clubhouse on Northwoods Blvd in Tahoe Donner, which is just past the stop sign on the right. Starts on the dam by Martis Creek Reservoir. Turn right out of the driveway, go straight through the roundabout, straight through the light and turn left onto Joerger Drive. Turn right onto Martis Creek Rd. and park. Follow Martis Creek Rd. uphill towards the dam – at the end of the dam the shady trail leads into the trees to the right and leads up to Dry Lake- follow the signs to the Lake (which might be dry in late summer—hence the name of the small lake). and alpine country. Indeed, the PCT is a trail of diversity and extremes. From scorching desert valleys in Southern California to rain forests in the Pacific Northwest, the PCT offers hikers and equestrians a unique and varied experience. course of a day hike. Whether you visit the PCT for a few hours or for a few weeks, you’ll surely find a uniquely Western scene that will rejuvenate, inspire, and surprise you. Two thousand six hundred and fifty miles of adventure and discovery are waiting. will give you a small insight of what wilderness hiking is like. The easiest access is at Donner Summit (see Mt. Judah Loop). Tahoe Elite knows all the best access points. We can drop you and your gear at your in-point and meet you for a pick-up down the trail. The Mt. Judah loop trail is accessed off the Pacific Crest Trail south of old Hwy. 40. Tahoe Elite will take you along the shore of Donner Lake and the gorgeous climb of Hwy. 40. The PCT south starts by climbing steeply up a granite headwall then flattens and follows the contours of the mountain, climbing moderately. 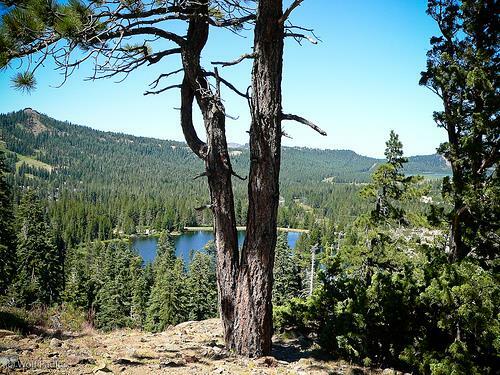 Approximately one-mile from Donner Pass, turn left onto the Judah loop trail. The trail gently climbs to an existing jeep road near Coldstream Pass (between Mt. Judah and Donner Peak). Turn left onto this scenic jeep road and follow the trail which loops back onto the PCT. This trail starts in Squaw Valley at the end of Squaw Peak Rd. The entrance to Squaw Valley is 8 mi. south of Truckee on Hwy 89. The trail can be a bit confusing, but you can’t go too wrong. Keep the large creek on your right on the way up the canyon. Look for blue paint marks on rocks to help you stay on the trail. Keep heading up and up and up, until you get to Shirley Lake, which is at the bottom of a ski lift. This portion of the trail is about 2.5 miles in length. 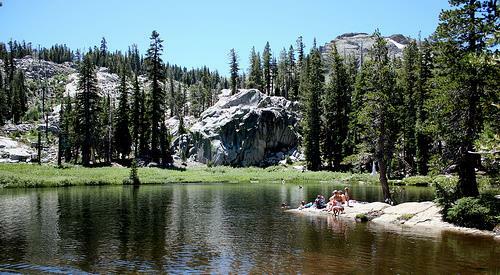 If you choose to continue up to High Camp from Shirley Lake, it will add approximately 1.5 miles to your journey. Shirley Canyon is a lovely trail that includes a wonderful variety of environments. First you enjoy an easy hike with some interesting wet seeps in the forest floor, then you follow a creek that is cascading down the canyon, eventually moving back into the deep woods, and finally emerging onto some extensive granite rock scrambling – welcome to Shirley Lake. There are some steep pitches to negotiate. Hiking boots and lots of water are strongly recommended. This trail has a steep grade, but it’s mercifully short, which makes it incredibly popular with hikers during the high season. This is a perfect off-season hike. The first 1/2 mile is the steepest grade, and the next 3/4 of a mile continues uphill more gradually to the top of a ridge. Switchbacks make it easier, but there is almost no shade along the route, as you climb 1000 feet. At 1.8 miles, you reach the Granite Chief Wilderness boundary and enter a land of red fir, white fir, and rocks. A signed junction, a 1/4 mile farther, points you to the left toward the lakes with the trail heading directly downhill to the largest of them. From there you can follow numerous side trails to the four other lakes, all east of the big one. Most people don’t go any farther than the first big lake where the swimming is excellent. The five lakes are set at 7400 feet; remember to bring sunscreen! The sun is strong at that high of an elevation. 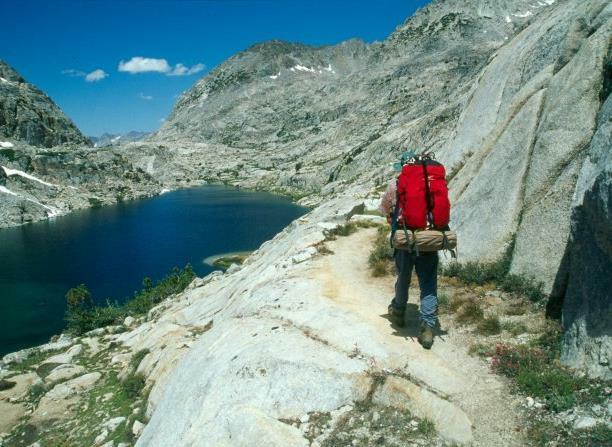 If you are seeking a challenge and want to be out hiking all day Five Lakes offers the great option of continuing onto the Pacific Crest Trail towards Squaw, which provides an isolated wilderness experience with fantastic views. Tahoe Elite can pick you up at either end. Truly, a “Trail like No Other.” The Tahoe Rim Trail is one of the world’s premier trails. It passes through two states (California and Nevada), six counties, one state park, three National Forests, and three wilderness areas. This spectacular trail is 165 miles of single-track multiuse, winding from peak-to-peak around Lake Tahoe. It is a trail that offers something for everyone! Hiking and horseback riding are allowed on all portions of the trail, while mountain biking is allowed on the trail except in wilderness areas, Lake Tahoe Nevada State Park, and on trail segments that overlap the Pacific Crest Trail. The TRT Association was formed in 1981 as a non profit. The construction of the trail started in 1984 and the trail was completed in September of 2001.
hike a portion of one segment as an “in and out” hike – meaning you walk as far as you feel like and turn around.